Goan-origin pianist-pedagogue Noel do Carmo Flores, whose masterclasses attracted piano students from all over the world, died on 19 May 2012 in Vienna, Austria after a brief illness. He was 77. Born in Siolim, Goa, Flores’ prodigious musical talent manifested at the age of five, when he began playing the piano at the instance of his mother. His first tutor in Goa was Prof. Alfredo da Gama. Fr. Carreño at Don Bosco School, Panjim realised that the youth had a remarkable gift, and with the additional encouragement of Maestro António de Figueiredo, a Spanish scholarship was arranged for him in 1955 to study at the Royal Conservatory of Music, Madrid under D. Julia Parodi, disciple of the legendary Italian piano virtuoso and composer Ferruccio Busoni. At the end of his studies there, Flores participated in the Conservatory’s piano competition, where he not only bagged the first place but also the special “Carlos Luque” prize. Despite not being a Spanish citizen, he represented the province of Castile in the Festival of Music in Spain. His piano recitals at the Sala Internacional of the Fomento de las Artes Españoles, Madrid, and in Seville and Cordoba won high acclaim. A Gulbenkian scholarship then enabled Flores to further his studies at the Hochschule für Musik und Darstellende Kunst in Vienna, with Hans Graf and then Dieter Weber, who invited him to become his assistant. His fame as a pianist of extraordinary calibre grew steadily, at the concert stage and at international competitions. He won the First Medal at the Geneva International Competition, and in Munich and Vienna, and an award from the Ministry of Education and Culture of the Austrian Government. In 1979, Flores was offered a chair as Professor at the University of Music in Vienna, where his reputation as a pedagogue quickly spread across the globe, attracting students from far and wide. His masterclasses were held in Austria, Germany, Finland, Sweden, United Kingdom, Korea and Japan. His students have gone on to win international competitions themselves, and several of them are renowned teachers, and international recording and performing artists. He had a keen interest in analysing the role of mind and body in performance of the instrument. He therefore undertook in-depth research of the anatomy and functioning of the human body, and of yoga techniques, and incorporated these principles in his teaching. 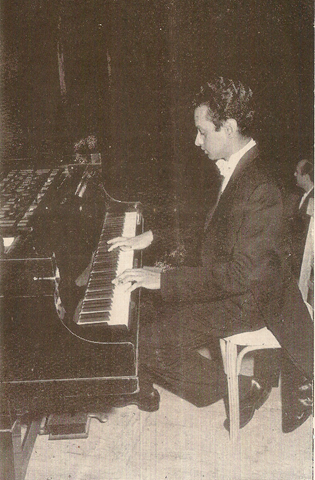 Flores was often invited as member of jury to international competitions in Leeds, Vienna, Leipzig (Bach competition), Tel-Aviv (Rubinstein competition, Spain, Portugal, Greece, Italy, South Africa and Chile. In 1997, he was awarded the Order of Merit for his outstanding services to Austria. He is survived by his wife Regina, and son Sergio. You might try making contact with Victor Rangel-Rebiero (Goan author based in NY) about Noel Flores — he may snippets to share. I met him and his lovely late wife Lea in Washington DC a few years ago. While talking music, I do recall him mentioning Noel Flores’ effective technique. Very much enjoying following your lovely blog. Hello Luis…Thank you for your article on Prof.Noel Flores. He was born in Siolim. if you wish i can take you to the house where he lived for some time in Siolim. In my own little way I have paid my tribute to him with his sketch in my cartoon space on the front page of Gomantak Times dated 30 May 2012. I also mentioned the Mass for his soul at Don Bosco’s , Panjim at 4.30 pm. on 30 may 2012. Today. I can email you his sketch (of his younger days) if you wish…so also to his nephew Christopher Flores..if you give me (his) your email. Alexyz (Cartoonist) email: > alexyzhahoo@yahoo.com < ps. I also live in Siolim. Hello and thank you for writing this obituary for Prof. Flores. For me, he was the best teacher of all. His burrial is taking place today, the 30.of May, in Vienna, at 14:00.